CONTEXT: Homology modeling plays role in determining the therapeutic targets dreadful for condition such as neurodegenerative diseases (NDD), which pose challenge in achieving the effective managements. The structures of the serotonin transporter (SERT), aquaporin (AQP), and tropomyosin receptor kinase (TrkA) which are implicated in NDD pathology are still unknown for Lumbricus terrestris, but the three-dimensional (3D) structure of the human counterpart for modeling. AIM: This study aims to generate and evaluate the 3D structure of TrkA, SERT, and AQP proteins and their interaction with the ligands, namely Asiaticoside-D (AD) and levodopa (L-DOPA) the anti-NDD agents. SUBJECTS AND METHODS: Homology modeling for SERT, AQP, and TrkA proteins of Lumbricus terrestris using SWISS-MODEL Server and the modeled structure was validated using Rampage Server. Wet-lab analysis of their correspondent m-RNA levels was also done to validate the in silico data. RESULTS: It was found that TrkA had moderately high homology (67%) to human while SERT and AQP could exhibit 58% and 42%, respectively. The reliability of the model was assessed by Ramachandran plot analysis. Interactions of AD with the SERT, AQP-4, and TrkA showed the binding energies as −9.93, 8.88, and −7.58 of Kcal/mol, respectively, while for L-DOPA did show −3.93, −5.13, and −6.0 Kcal/mol, respectively. The levels of SERT, TrkA, and AQP-4 were significantly reduced (P < 0.001) on ROT induced when compared to those of control worms. On ROT + AD supplementation group (III), m-RNA levels were significantly increased (P < 0.05) when compared to those of ROT induced worms (group II). CONCLUSION: Our pioneering docking data propose the possible of target which is proved useful for therapeutic investigations against the unconquered better of NDD. Three-dimensional (3D) structure of a target protein from the amino acid sequence of homologous proteins could be predicted using X-ray or nuclear magnetic resonance structural analyses. From the earthworm Lumbricus rubellus, 8129 unique-expressed sequence tags were isolated., Of which, around 21% of gene (1728) exhibit significant homologies to counterparts documented in the genome of the nematode (Caenorhabditis elegans), the fruit fly (Drosophila melanogaster), and humans (Homo sapiens), highlighting that within most of eukaryotic organisms, the key in biological and metabolic pathways is preserved. Besides, it is very interesting to note that the cohorts of earthworm showed higher percentage (%) of homology with the humans (220 genes) when compared with those of fruit fly (68 genes) and nematode (49 genes). According to the studies, 14,000 of protein-coding human gene are related to worm's gene and 70% of the gene was known to be associated with human disease. As worms were reported to exhibit similar structural, functional, and signaling features as that of mammalian systems. Their simple nervous system could be an ideal candidate of replica for investigation that aims in the exploration of neurobiology of humans. The mammalian nerve growth factors (NGF) is similar to worms gene: NGF is now known to stand at the apex of the ngf pathways also conserved in mammals that is crucial for differentiation, migration, cell polarity, and axon guidance during neuronal development, learning and memory,,, and the efficacy of synaptic transmission. Aquaporin (AQP) is a channel protein which manages water transport in plants, microbial organisms, invertebrates (insects, ticks, and nematodes), and vertebrates. The water transport is a fundamental process in neuronal function, and the AQPs are expressed in tissues where a fluid balance is of a major concern. In brain, AQPs were reported for regulating water homeostasis, edema, angiogenesis, cell migration, and development. They were found to be abnormally expressed in pathological conditions such as neuroinflammatory diseases and neurodegenerative diseases (NDD), in which preservation of brain homeostasis is at risk,, and thus AQPs have been selected for docking analysis in this study. Docking studied the drug design and is regularly used to predict the binding actions of drug molecules to their targeted proteins. The biological and pharmaceutical significance of molecular docking was well-understated. Many current treatments focus on preventing the loss of neurotransmitters or replacing their depleted neurotransmitters such as levodopa (L-DOPA) for replacing dopamine in Parkinson's disease and donepezil in the treatment of Alzheimer disease. Although these are also studies which are interested in assessing the impact of gene therapy and stem cells against neurodegeneration (ND), ND therapy is still focused on identifying the drug molecules which can target key molecules that can cause the debilitating ND condition. Lee and Kim studied human catecholamine-O-methyltransferase for designing anti-PD drug using the ligand docking and homology modeling. Modeling plays role in determining the therapeutic targets dreadful for condition such as NDD, which pose challenge in achieving the effective managements. The structures of the SERT, AQP-4, and TrkA which are implicated in NDD pathology are still unknown for Lumbricus terrestris, but the 3D structure of the human counterpart for modeling. Through this point, it can be suggested that the binding interaction between drugs and its molecule targets can be considered for building therapeutic strategies; the wet-lab data could be considered for feature research. As in silico studies in model systems have validated “energy sufficiency” as a promising therapeutic approach, we aimed at elucidating the structure similarity of proteins of L. terrestris with those of humans and in assessing their signified interaction with drugs that were proven for their neuroprotective effects. 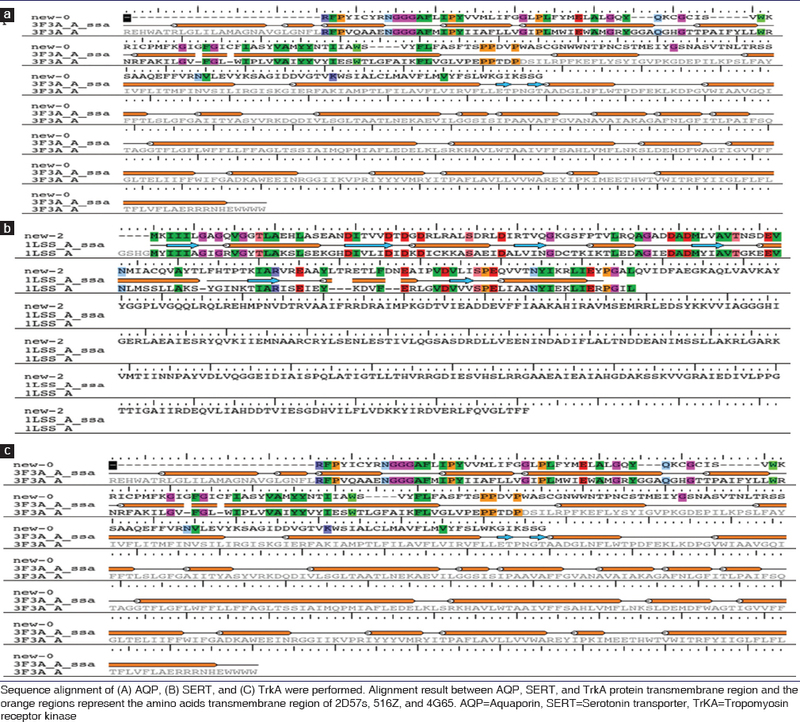 The sequences of SERT, AQP, and TrkA protein of earthworm were retrieved from the Universal Protein Resource (Uniprot) in the FASTA format. The crystal structures of these proteins of L. terrestris are not available in protein databank database (PDB) and hence were retrieved from the templates such as SERTs (PDB ID: 5I6Z), TrkA (PDB ID: 4G65), and AQP (PDB ID: 2D57s). The 3D structure of the protein (NAME) was modeled using a SWISS-MODEL Server, which is based on homology modeling. The structure validation was validated using Rampage Sever. Asiaticoside-D structure was drawn using ChemDraw software and converted to their 3D structure using Openbabel software. L-DOPA was retrieved from PubChem (ID No. 6047) which is reported to alter the locomotors and rigidity as side effect was observed. Analysis of protein structure energy was minimized using chimera software. Binding sites of protein were analyzed using the SITEHOUND server. In the current study, docking was studied using AutoDock provided by the Scripps Research Institute (version 4.2, La Jolla, CA) and molecular dynamic stimulation. Estimated binding energy (ΔG binding) kcal/mol and inhibition constant (Ki) were calculated. Binding energy = Intermolecular energy + Torsional energy. Here ΔG = change in free energy. The laboratory maintained worms were randomly divided into five groups with each group containing twelve L. terrestris. Group V: L. terrestris exposed to 0.2% of dimethyl sulfoxide for 7 days. After the experimental time, the worms were euthanized. The CGs were dissected out and were used for further investigation. Semiquantitative reverse transcription-polymerase chain reaction (Semi-QRT-PCR) was performed as 20 μl of reaction mixture containing 2.0 μl of cDNA, 500nM of forward primer, 500nM reverse primer, and 10 μl PCR Master Mix. The cycling conditions were as follows: initially denaturing at 95°C for 5 min, denaturing at 95°C for 15 s, annealing 60°C for 20 s, and extension at 72°C for 30 s. 5 μl of each PCR products was loaded with 2.0% agarose gel and UV was visualized using gel documentation system. The β-actin served as loading control and band intensities were analyzed using image J software. Primer sequences (Primer 3 software) were follows: SERT (FP: CCAGTGTCACCAACCTCACA and RP: ACCACTTGACCGTTCCAACA), AQP-4 (FP: TTCCGCATCACCAACTCTCC and RP: CTGCTGAGGAGGATTCACGG), TrkA (FR: CCCTGAAGGAAGTGACGGAG and RP: GTGTAGGCTGACCACATGCT), and β-actin (FP: TCTCGGCGATTTTGTCCCAT and RP: GAGCATGTGTGTGGTGTCCT) used for RT-PCR. The AQP, SERT, and TrkA protein structures were used for SWISS-MODEL Server [Table 1]. Homology showed that TrkA had moderately high homology (67% identity) to human while SERT and AQP had exhibited 58% and 42% of identity, respectively, toward those of human origin. The query cover and chain were shown in [Table 2]. The protein structures were validated by the use of Rampage severs [Figure 1]. 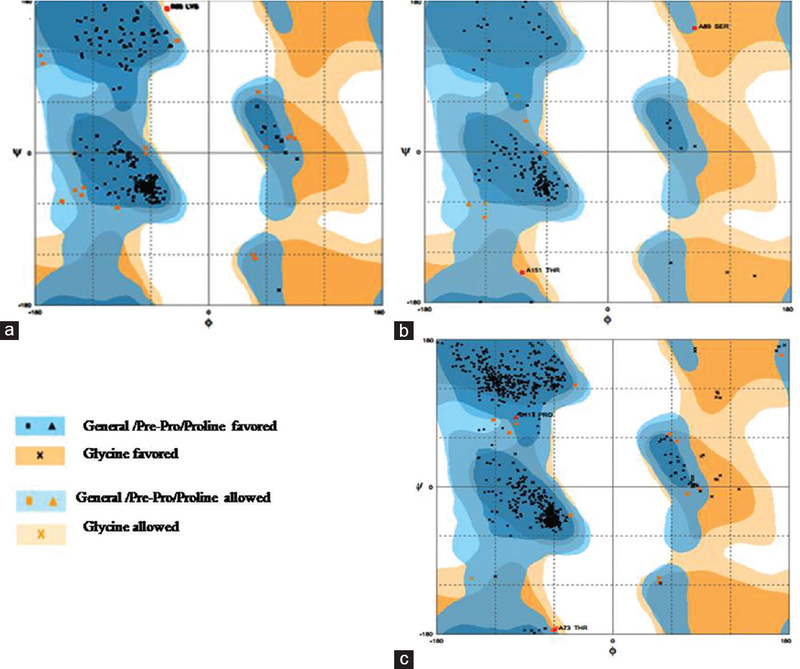 The 3D structure of AQP showed 94.9% amino acid residue in the preferred areas, 4.7% amino acid residue in the allowed areas, and 0.4% amino acid residue in the outlier areas; SERT showed 95.5% amino acid residue in the preferred areas, 3.4% amino acid residue in the allowed areas, and 1.1% amino acid residue in the outlier areas; whereas TrkA showed 97.9% amino acid residue in the preferred areas, 1.9% amino acid residue in the allowed region, and 0.2% amino acid residue in the outlier areas [Table 3]. 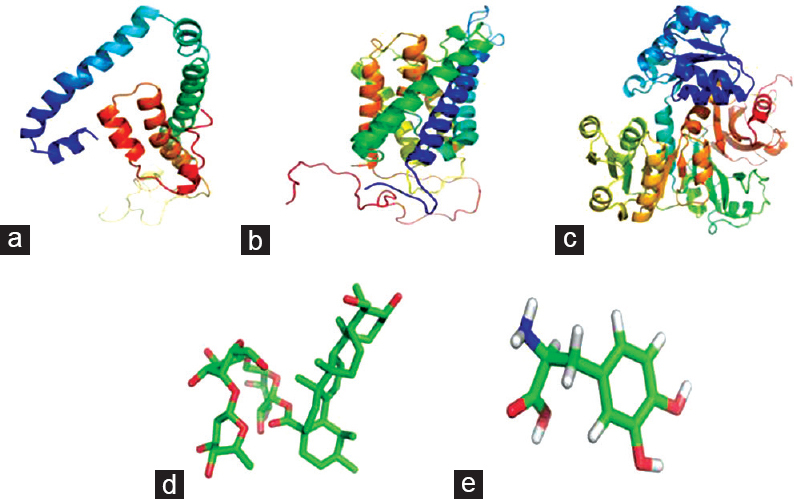 The 3D structure of proteins and drugs were shown in the [Figure 2]a,[Figure 2]b,[Figure 2]c,[Figure 2]d,[Figure 2]e. The interaction of amino acid residues of SERT, AQ, P and TrkA with both AD and L-DOPA was identified [Figure 3]a,[Figure 3]b,[Figure 3]c,[Figure 3]d,[Figure 3]e,[Figure 3]f. The binding interactions of AD were as follows: with residues Asn122 of SERT; with AQP residues Thr41; and with TrkA residues Arg373, Ala340, and Glu143. The protein SERT, AQP, and TrkA showed the binding energy −9.93, 8.88, and −7.58 of Kcal/mol, respectively, and inhibition constant as 2.43 mM, 307.80 nM, and 2.79 μM, respectively. 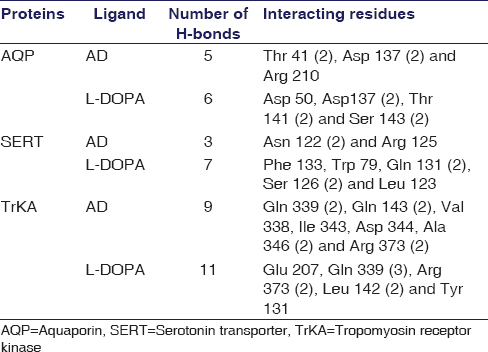 The binding interaction of L-DOPA with the SERT residues (Leu123, Try79, Phe133, Ser126 and Gln131), AQP (Ser143, Thr14, AP50, ASP137 and Thr141), TrkA (Try131, Ser142, Arg373 and Gln339), it was found that the SERT, AQP and TrkA had exhibited very low binding energy −3.93, −5.13, and −6.0 Kcal/mol with inhibition constant 1.32 mM, 52.53 nM, and 39.97 μM respectively [Figure 3] and [Table 4], [Table 5]. AD could exhibit higher binding energy with SERT (-9.93Kcal/mol). The m-RNA levels of SERT, TrkA, and AQP-4 were significantly reduced (P < 0.05) on ROT exposure (Group II) when compared to those of control group(I). ROT + AD supplementation of SERT, TrkA, and AQP-4 were significantly increased (P < 0.05) when compared to those of ROT-induced worms, suggesting the protective action of AD was given to normal worms (in Group IV), there were no significant variations from those of control (Group I) in the levels of m-RNA [Figure 4]. The memory enhancing and cognitive effects of Centella asiatica are believed to be mediated by its components such as asiaticoside, asiaticoside-E, and asiatic acid., Studies have identified that asiaticoside can act as a high-affinity tropomyosin kinase receptor (TrkA) agonist and that can provoke receptor dimerization, autophosphorylation, and activation of downstream signaling. Asiaticoside was reported to interact with residues such as tyrosine Tyr 490, Arg 125, Gln 144, Asp 248, and a limited Tyr785 and Tyr674/675 at the active site of TrkA., Similar to this report, our study has found an in silico interaction between AD and TrkA [Figure 3]c as also supported by a report highlighting an interaction between asiaticoside and TrkA receptor. This interaction may upregulate the tyrosine phosphorylation on TrkA residues and activates its downstream signaling. The observed in silico interaction can be interpreted to promote the activation of cell growth and survival thereby acting against ROT-induced cell degeneration in CGs. We also showed that m-RNA levels of TrkA were significantly reduced (P < 0.001) on ROT while AD can maintain their levels in CGs as observed by RT-PCR [Figure 4]. Hence, it is presumed that they may regulate Ras/Raf/MAP kinase, PI3K/Akt, and PLC-γ signaling pathways in CGs. The observed interaction of asiaticoside with the residues of AQP, namely arginine 159, 160, serine 180, threonine 157, and glycine 165 could be supported by Migliati et al. Maintenance of water homeostasis could be achieved by interaction of asiaticoside (AS) with AQP, the water regulating channel as shown by Hossain et al. Further, arginine 210 in AQP loop was reported to regulate the water channel regulation by phosphorylation. AQPs are abnormally expressed in ND condition, during which conservation of brain homeostasis is at possibility. They are said to influence potassium (K+) and calcium (Ca2+) ions transport which could play important roles in the pathogenesis of NDD patients., AQ P-4 was significantly affected by ROT, and AD could influence AQ P channels that clear the water in excess and maintain the water homeostasis in CGs [Figure 4]. As the reports have shown that AQP-4 was down regulation of NDD patients; observations made in the current study suggests the structure the idea of protective action of AD perhaps via it affect on AQP-4. The current in-silico analysis also had shown that the AD can formed hydrogen bond with SERT residues Asn122 [Figure 3]b, which is regulate the transport mechanism of neurotransmission. The interesting finding was that the interaction score of AD with SERT was comparatively more than that of L-DOPA with SERT. It was reported earlier that bacosides and asiaticoside, nonpolar glycosides, may be transported across blood–brain barrier and interact with SERT and hence may prove useful against NDD. 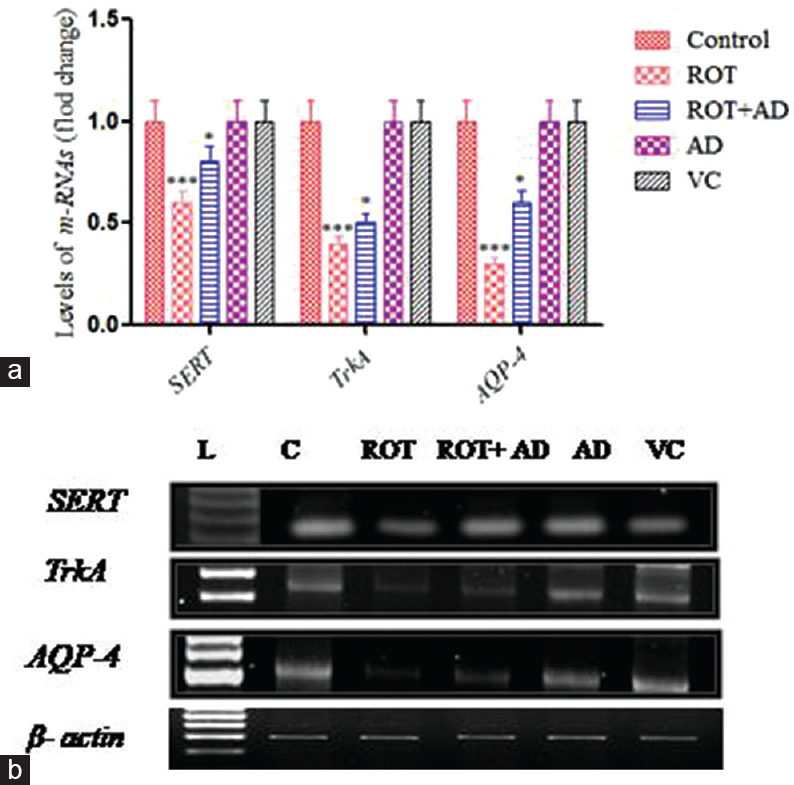 The observation of the reduced level of SERT in ROT- induced striatum degeneration of rats as supported by Hoglinger et al., and the comparative increase of SERT [Figure 4] on ROT+AD treatment highlights the effect of AD. Hypothetically by virtue of its binding, AD might regulate the termination of synaptic signaling and reuptake into the presynaptic neurons in CGs which however do require lot of investigation to prove. This may exert neuroprotective effect against ROT-induced degeneration. Thus, it is inferred from such upregulated SERT m-RNA levels [Figure 4] and binding interactions that AD might improve cognitive and movement abilities which are precipitated by ROT-induced degeneration in worms. Our observation suggests that AD from the C. asiatica can have better binding features with the SERT proteins that govern cognition/motor functions which are impaired in the various types of ND thereby exhibiting its potential against such complaints. The homology modeling of proteins of earthworms, namely SERT, TrkA, and AQP which were derived utilizing the highest resolution X-ray crystal structure of SERT, TrkA, and AQP of human did exhibit significant binding interaction with the neuroprotective ligand and establish themselves as ideal candidates as drug targets in the anti-NDD strategies. The authors acknowledge the financial support for University Grants Commission – Basic Science Research, New Delhi-110 002. Sturzenbaum SR, Parkinson J, Blaxter M, Morgan AJ, Kille P, Georgiev O. The earthworm expressed sequence tag project. Pedobiologia 2003;47:447-51. Owen J, Hedley BA, Svendsen C, Wren J, Jonker MJ, Hankard PK, et al. Transcriptome profiling of developmental and xenobiotic responses in a keystone soil animal, the oligochaete annelid Lumbricus Rubellus. BMC Genomics 2008;9:266. Philippe H, Lartillot N, Brinkmann H. Multigene analyses of bilaterian animals corroborate the monophyly of ecdysozoa, lophotrochozoa, and protostomia. Mol Biol Evol 2005;22:1246-53. Wiesmann C, de Vos AM. Nerve growth factor: Structure and function. Cell Mol Life Sci 2001;58:748-59. Freeman RE, Wicks AC, Parmar B. Stakeholder theory and the corporate objective revisited. Organ Sci 2004;15:364-9. Guan Z, Buhl LK, Quinn WG, Littleton JT. Altered gene regulation and synaptic morphology in Drosophila learning and memory mutants. Learn Mem 2011;18:191-206. Gomez M, De Castro E, Guarin E, Sasakura H, Kuhara A, Mori I, et al. Ca2+ signaling via the neuronal calcium sensor-1 regulates associative learning and memory in C. elegans. Neuron 2001;30:241-8. Pu L, Kopec AM, Boyle HD, Carew TJ. A novel cysteine-rich neurotrophic factor in Aplysia facilitates growth, MAPK activation, and long-term synaptic facilitation. Learn Mem 2014;21:215-22. Skaper SD. Nerve growth factor: A neuroimmune crosstalk mediator for all seasons. Immunology 2017;151:1-15. Weicker H, Strüder HK. Influence of exercise on serotonergic neuromodulation in the brain. Amino Acids 2001;20:35-47. Oh SE, Mouradian MM. Regulation of signal transduction by DJ-1. Adv Exp Med Biol 2017;1037:97-131. Kilic F, Murphy DL, Rudnick G. A human serotonin transporter mutation causes constitutive activation of transport activity. Mol Pharmacol 2003;64:440-6. Prasad HC, Zhu CB, McCauley JL, Samuvel DJ, Ramamoorthy S, Shelton RC, et al. Human serotonin transporter variants display altered sensitivity to protein kinase G and p38 mitogen-activated protein kinase. Proc Natl Acad Sci U S A 2005;102:11545-50. Zhang YW, Gesmonde J, Ramamoorthy S, Rudnick G. Serotonin transporter phosphorylation by cGMP-dependent protein kinase is altered by a mutation associated with obsessive compulsive disorder. J Neurosci 2007;27:10878-86. Zhong J. RAS and downstream RAF-MEK and PI3K-AKT signaling in neuronal development, function and dysfunction. Biol Chem 2016;397:215-22. Noda Y, Horikawa S, Kanda E, Yamashita M, Meng H, Eto K, et al. Reciprocal interaction with G-actin and tropomyosin is essential for aquaporin-2 trafficking. J Cell Biol 2008;182:587-601. Campbell EM, Ball A, Hoppler S, Bowman AS. Invertebrate aquaporins: A review. J Comp Physiol B 2008;178:935-55. Eid T, Lee TS, Thomas MJ, Amiry-Moghaddam M, Bjørnsen LP, Spencer DD, et al. Loss of perivascular aquaporin 4 may underlie deficient water and K+homeostasis in the human epileptogenic hippocampus. Proc Natl Acad Sci U S A 2005;102:1193-8. Lee TS, Eid T, Mane S, Kim JH, Spencer DD, Ottersen OP, et al. Aquaporin-4 is increased in the sclerotic hippocampus in human temporal lobe epilepsy. Acta Neuropathol 2004;108:493-502. Geromichalos GD. Importance of molecular computer modeling in anticancer drug development. J BUON 2007;12 Suppl 1:S101-18. Lee JY, Kim Y. Comparative homology modeling and ligand docking study of human catechol-O-methyltransferase for antiparkinson drug design. Bull Korean Chem Soc 2005;26:379-85. Waterhouse A, Bertoni M, Bienert S, Studer G, Tauriello G, Gumienny R, et al. SWISS-MODEL: Homology modelling of protein structures and complexes. Nucleic Acids Res 2018;46:W296-303. Schirmeier H, Neuhalfen J, Korb I, Spinczyk O, Engel M. Rampage: Graceful degradation management for cific Rim Inmemory errors in commodity linux servers. In: Dependable Computing (PRDC), IEEE 17th Pacific Rim International Symposium. IEEE; 2011. p. 89-98. Tamtè M, Brys I, Richter U, Ivica N, Halje P, Peterrsson P. Systems-level neurophysiological state characteristics for drug evaluation in an animal model of levodopa-induced dyskinesia. J Neurophysiol 2016;115:1713-29. Hernandez M, Ghersi D, Sanchez R. SITEHOUND-web: A server for ligand binding site identification in protein structures. Nucleic Acids Res 2009;37:W413-6. Kevin JB, Edmond C, Huafeng X, Dror RO, Eastwood MP, Gregersen BA, et al. Scalable algorithms for molecular dynamics simulations on commodity clusters. In: Proceedings of the 2006 ACM/IEEE Conference on Supercomputing. Tampa: ACM; 2006. Seifi M, Walter MA. Accurate prediction of functional, structural, and stability changes in PITX2 mutations using in silico bioinformatics algorithms. PLoS One 2018;13:e0195971. Vyas VK, Ghate M, Patel K, Qureshi G, Shah S. Homology modeling, binding site identification and docking study of human angiotensin II type I (Ang II-AT1) receptor. Biomed Pharmacother 2015;74:42-8. Wang Y, Jin Y, Chen Q, Wen M, Zhao H, Duan H, et al. Selectivity and ligand-based molecular modeling of an odorant-binding protein from the leaf beetle Ambrostoma quadriimpressum (Coleoptera: Chrysomelidae) in relation to habitat-related volatiles. Sci Rep 2017;7:15374. Paul S, Banerjee S, Vogel HJ. Ligand binding specificity of the Escherichia coli periplasmic histidine binding protein. His J Protein Sci 2017;26:268-79. 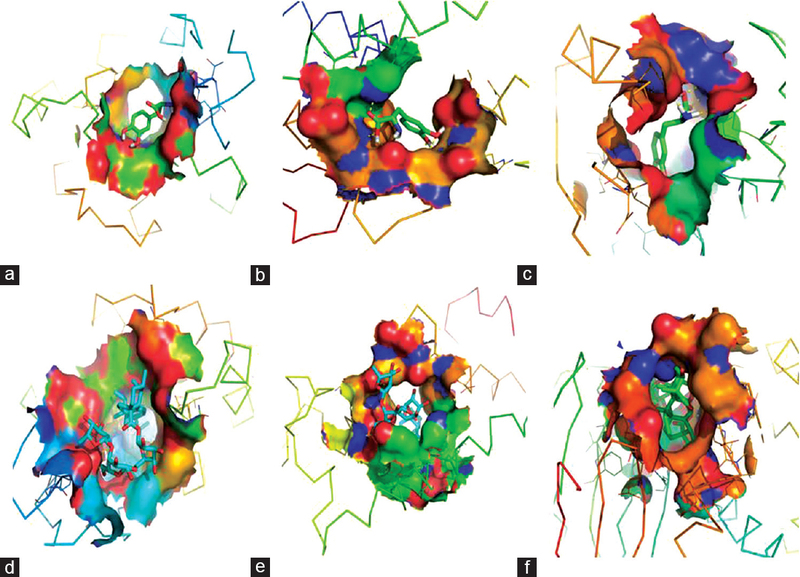 Kilambi KP, Gray JJ, Structure-based cross-docking analysis of antibody-antigen interactions. Sci Rep 2017;7:8145. Barradas-Bautista D, Fernández-Recio J. Docking-based modeling of protein-protein interfaces for extensive structural and functional characterization of missense mutations. PLoS One 2017;12:e0183643. Liu G, Li Z, Chiang Y, Acton T, Montelione GT, Murray D, et al. High-quality homology models derived from NMR and X-ray structures of E. coli proteins YgdK and Suf E suggest that all members of the ygdK/Suf E protein family are enhancers of cysteine desulfurases. Protein Sci 2005;14:1597-608. Françoijs CJ, Klomp JP, Knegtel RM. Sequence annotation of nuclear receptor ligand-binding domains by automated homology modeling. Protein Eng 2000;13:391-4. Wong WC, Maurer-Stroh S, Eisenhaber F. Not all transmembrane helices are born equal: Towards the extension of the sequence homology concept to membrane proteins. Biol Direct 2011;6:57. Takeda-Shitaka M, Takaya D, Chiba C, Tanaka H, Umeyama H. Protein structure prediction in structure based drug design. Curr Med Chem 2004;11:551-8. Chassaud LF, Fry BJ, Hawkins DR, Lewis JD, Sword IP, Taylor T, et al. The metabolism of asiatic acid,-madecassic acid and asiaticoside in the rat. Arzneimittelforschung 1971;21:1379-84. Chen S, Yin ZJ, Jiang C, Ma ZQ, Fu Q, Qu R, et al. Asiaticoside attenuates memory impairment induced by transient cerebral ischemia-reperfusion in mice through anti-inflammatory mechanism. Pharmacol Biochem Behav 2014;122:7-15. Vauzour D, Vafeiadou K, Rice-Evans C, Williams RJ, Spencer JP. Activation of pro-survival Akt and ERK1/2 signalling pathways underlie the anti-apoptotic effects of flavanones in cortical neurons. J Neurochem 2007;103:1355-67. Scarpi D, Cirelli D, Matrone C, Castronovo G, Rosini P, Occhiato EG, et al. Low molecular weight, non-peptidic agonists of TrkA receptor with NGF-mimetic activity. Cell Death Dis 2012;3:e339. Hossain S, Hashimoto M, Katakura M, Al Mamun A, Shido O. Medicinal value of asiaticoside for Alzheimer's disease as assessed using single-molecule-detection fluorescence correlation spectroscopy, laser-scanning microscopy, transmission electron microscopy, and in silico docking. BMC Complement Altern Med 2015;15:118. Migliati E, Meurice N, DuBois P, Fang JS, Somasekharan S, Beckett E, et al. Inhibition of aquaporin-1 and aquaporin-4 water permeability by a derivative of the loop diuretic bumetanide acting at an internal pore-occluding binding site. Mol Pharmacol 2009;76:105-12. Kamsteeg EJ, Hendriks G, Boone M, Konings IB, Oorschot V, van der Sluijs P, et al. Short-chain ubiquitination mediates the regulated endocytosis of the aquaporin-2 water channel. Proc Natl Acad Sci U S A 2006;103:18344-9. Pereda AE, Curti S, Hoge G, Cachope R, Flores CE, Rash JE, et al. Gap junction-mediated electrical transmission: Regulatory mechanisms and plasticity. Biochim Biophys Acta 2013;1828:134-46. Thenral ST, Vanisree AJ. Peripheral assessment of the genes AQP4, PBP and TH in patients with Parkinson's disease. Neurochem Res 2012;37:512-5. Chakravarty AK, Sarkar T, Nakane T, Kawahara N, Masuda K. New phenylethanoid glycosides from Bacopa monniera. Chem Pharm Bull (Tokyo) 2002;50:1616-8. Hoglinger GU, Feger J, Annick P, Michel PP, Karine P, Champy P. Chronic systemic complex I inhibition induces a hypokinetic multisystem degeneration in rats. J Neurochem 2003;84:1-12.